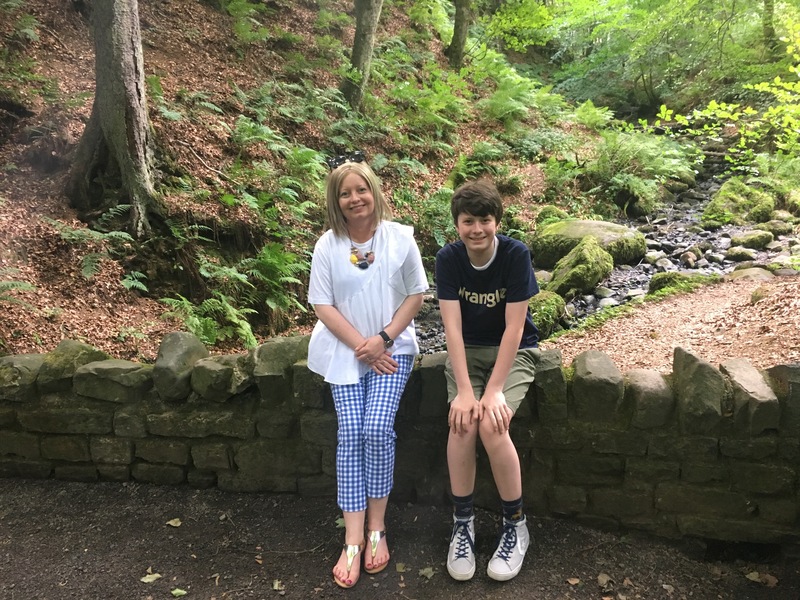 School holidays started (yippee), not for Husband but it was the best of both worlds when Son and I tagged along on his work trip to Co. Durham. 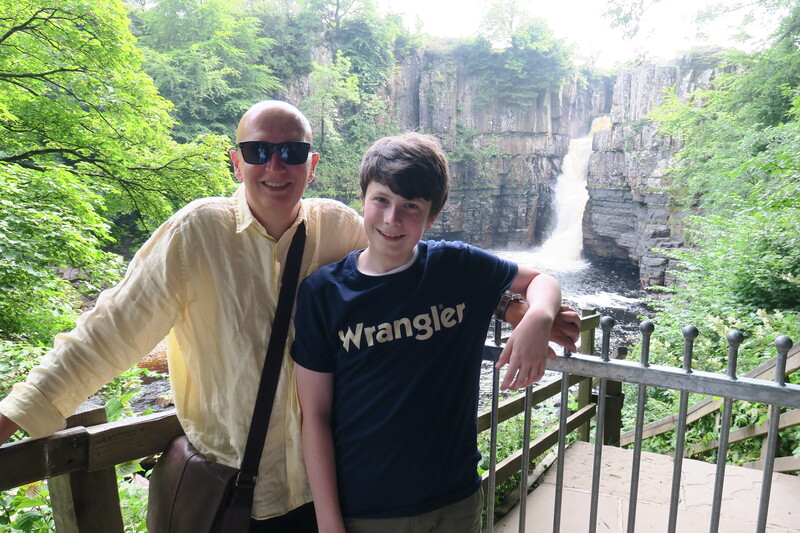 A few meetings en route, we opted to break up the journey a little more with a stop at High Force waterfall in Teesdale. Husband (in another lifetime at school) was here before, had good memories and fancied a return visit. We didn’t check the timings or make too many plans for this stop, pulled into the car park at 4.15 and breathed a sigh of relief the main gate to the waterfall didn’t close until 5 pm. However…..the very nice man working on the gate let us know his colleague had already gone ahead to lock everything up, but if we hurried we could still see the waterfall. He didn’t charge us the entrance fee – at £1.50 each and £3.00 for parking it wasn’t too much to worry about – and we quickly set off. Advice here – arrive early, don’t bet on them keeping everything open until 5, they obviously like to get home promptly. Time was of the essence so we didn’t bother about walking boots or any of that stuff, raced across the road and down the path to the waterfall. 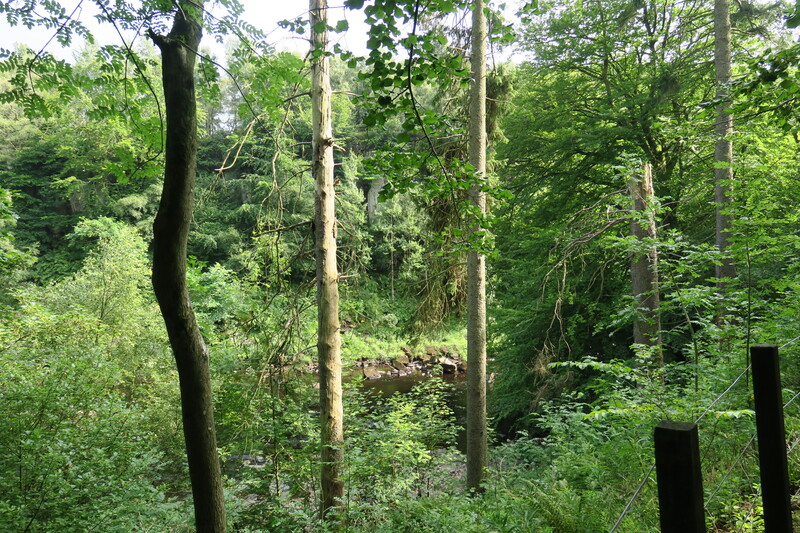 This is a gorgeous place, lush and green with lovely woodland and a very well maintained path. Even shod as I was, walking presented no problems. We strolled, listening to birdsong and soaking up that peaceful atmosphere. 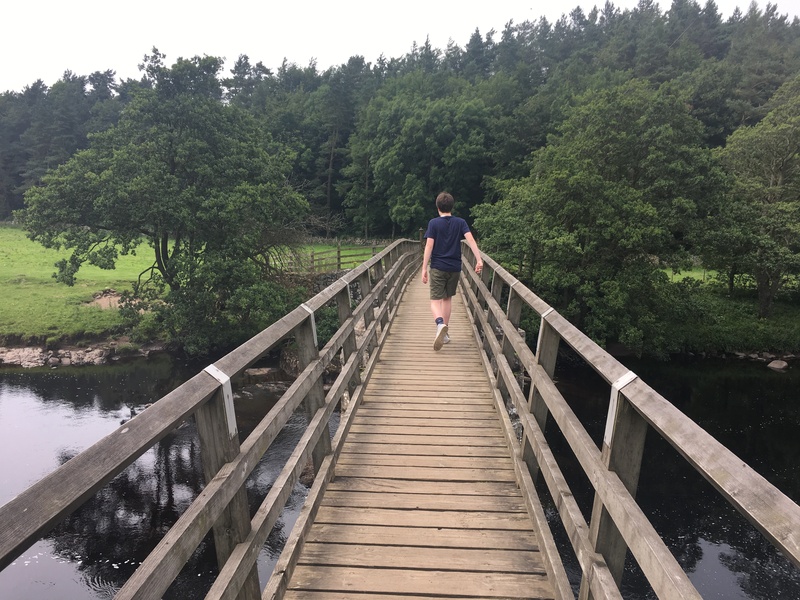 Son scampered and climbed, having been cooped up in the car for a couple of hours this was perfect for him. 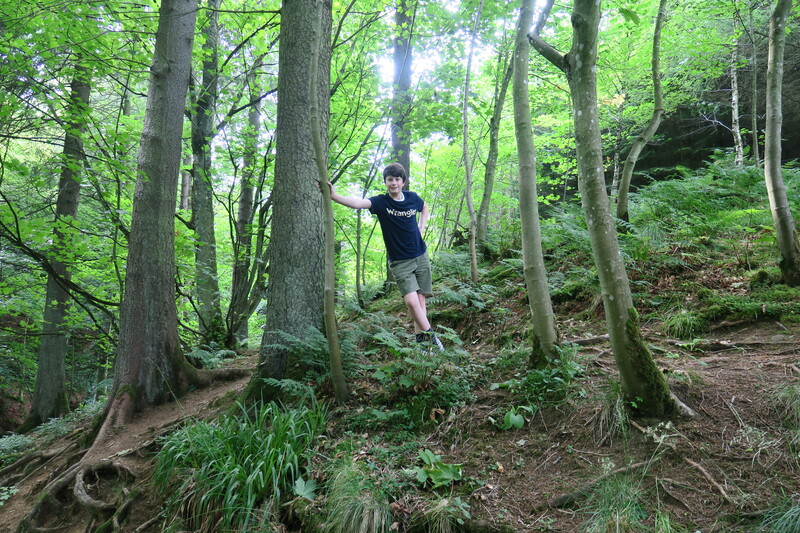 Loads of steep banks and places to explore meant he was in his element. 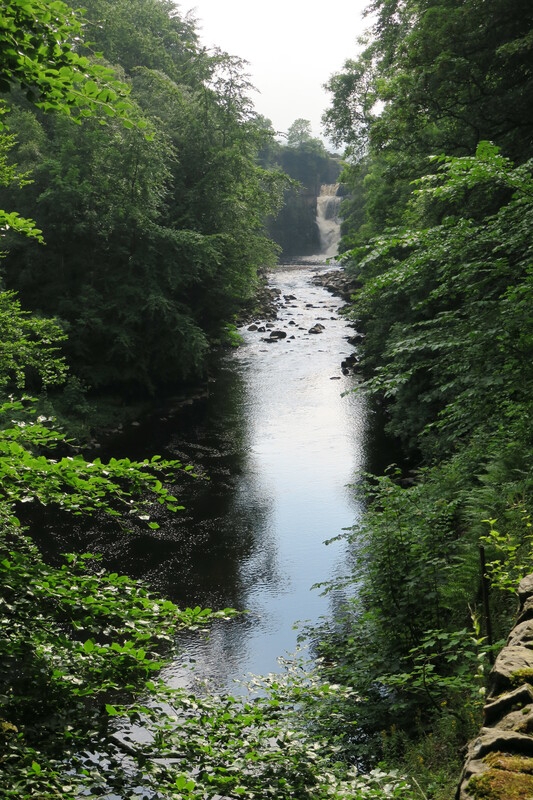 Soon we heard the rushing of water and could see High Force in the distance. It is impressive and pours over rocks 21 metres into a rock pool below. 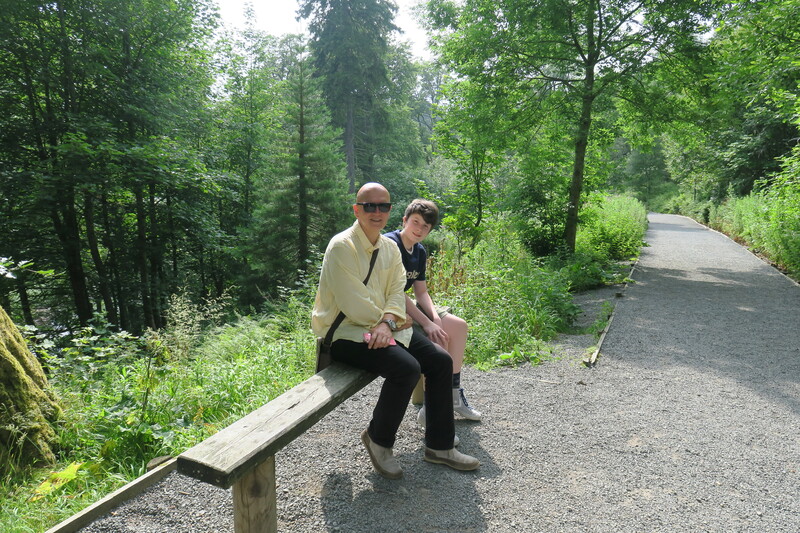 We were still able to access the wooden viewing platform at the base of the falls, stood for a while and took it all in. This is not the highest waterfall in England apparently, but it does have the largest volume of water falling over an unbroken drop. We were disappointed the gates were closed early but still did get a good view of the waterfall. 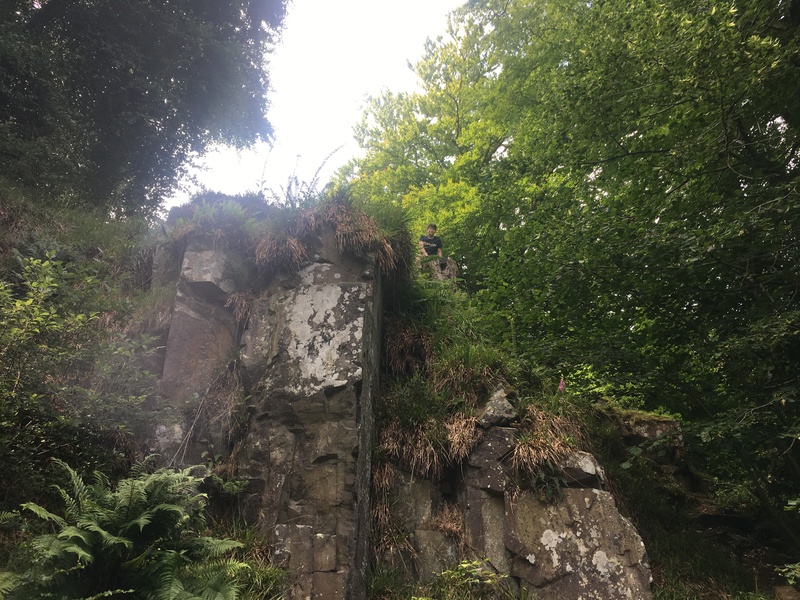 However we couldn’t access the viewpoint slightly lower than ours and also weren’t able to climb the steps to the top of High Force. Husband remembered on his school trip going up there and dangling his legs over the falls. Not sure with Health and Safety on the agenda nowadays that would be possible but it would have been nice to hike up and see for ourselves. 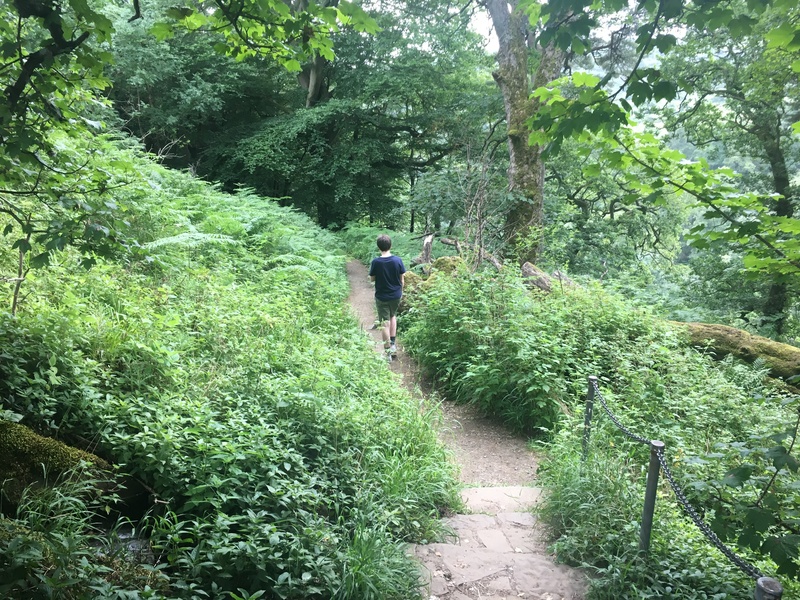 On the way back to the car park Husband noticed a sign by the exit giving directions to the waterfall by a different route if the gates are shut. 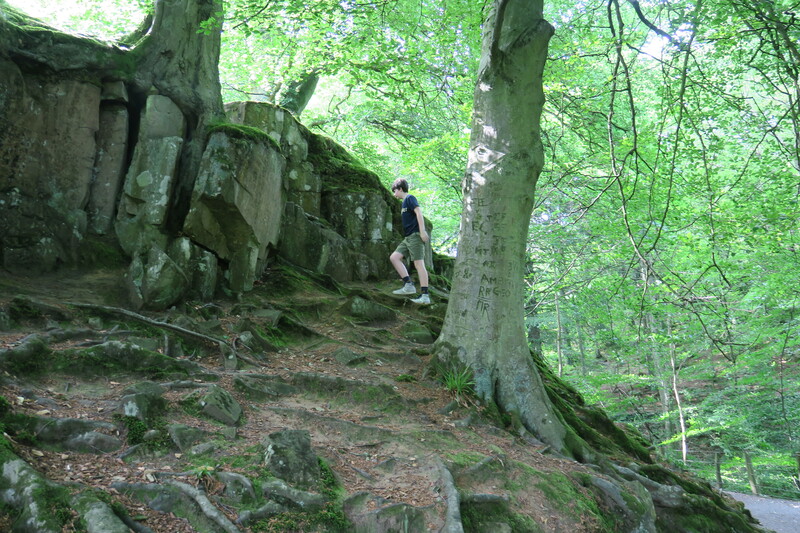 We decided to try this, it was a public path and after a change of shoes into something a bit more sturdy we set off. 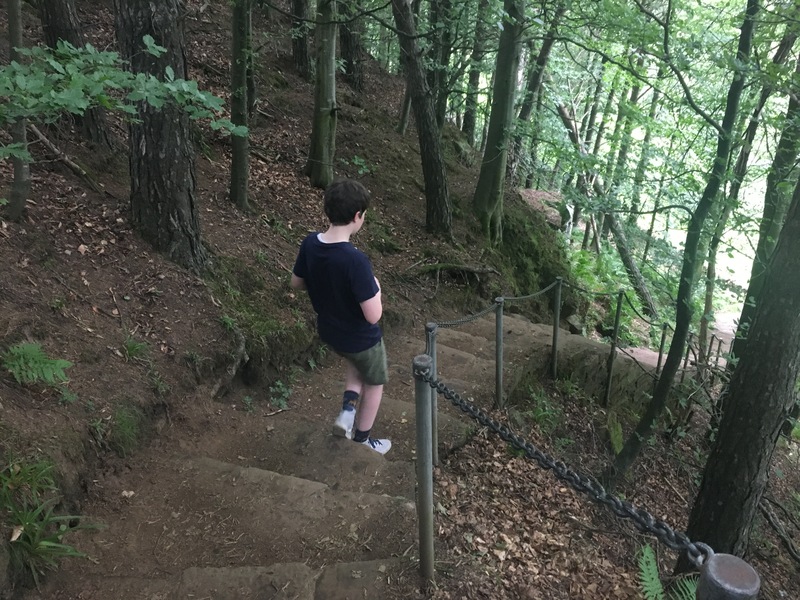 A descent of 80 odd steps and we were in a lovely meadow beside a fast flowing river. Across a bridge we found the reasonably good path towards the waterfall. 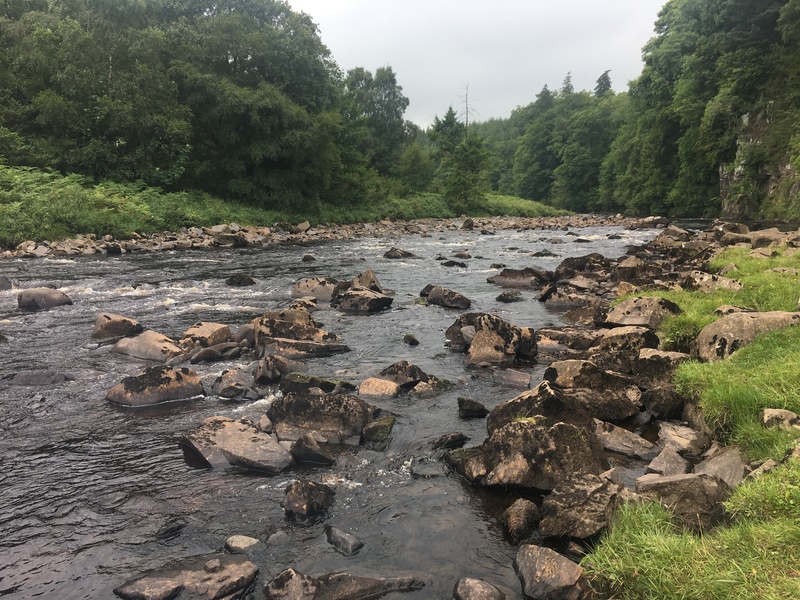 Fairly level and all looked good until Son and I realised we had acquired a significant number of insect bites. They were ferocious, we carried on but so did the insects, common sense kicked in and I questioned how sane it would be to continue. This was day one of our short break, I didn’t fancy nursing a series of itchy and ugly bites over the next few days. Reluctantly we turned back having only completed about a third of the walk. We retraced our steps across the meadow (rather speedily to attempt to beat the insects a bit), back up to road level and our car. Disappointing we hadn’t managed to see High Force from all angles but we pleased we had seen it – it is a beauty. That forest looks pretty magical! I should really go back up North one of these days…it seems like so much of the countryside there is just ridiculously pretty. Magical is the perfect word for this place – it was gorgeous and so peaceful. It really was stunning, so lush, green and beautiful. What a great-looking hike. Looks like you had fun and must have been nice for your husband to bring back memories and share them. Absolutely – nice for us to tag along on a work trip too and do something nice!! What a lovely post and photos Joy. 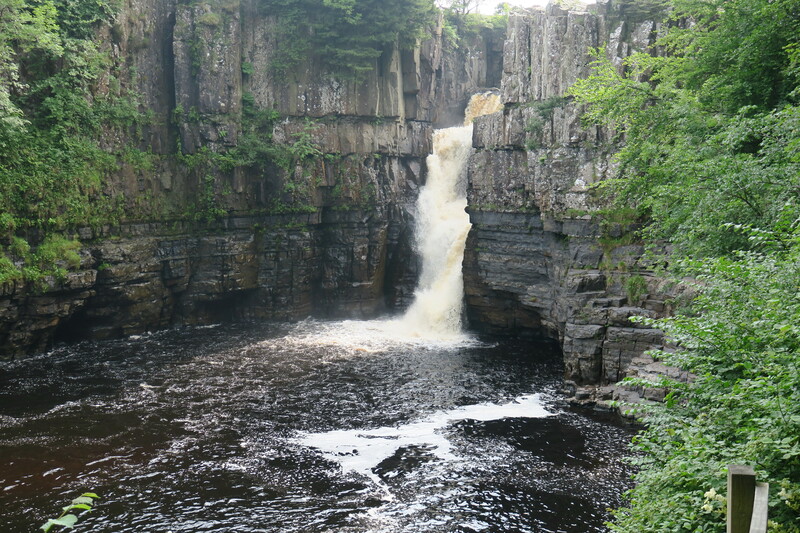 I also visited High Force as a child but with my parents rather than on a school trip. I haven’t been back since but your post is encouraging me to do so. I have to confess my ignorance Marion and admit I didn’t know much about High Force before this trip. My husband remembered how much he enjoyed it on a school trip and I’m so glad we did stop off there. It is gorgeous, so green and lovely and the walk down is stunning. Thank you!! It is a gorgeous place. What a fairytale-like area? I love this!! I just noticed how tall your son has grown!! Isn’t it just gorgeous Erika. He is growing like a weed right now, every week he seems to be a bit bigger!! Oh, I hear you!! How old is he? So he is one year younger than my youngest son. He turns 15 in September. All of a sudden, they are like rockets… lol! I know – it is still amazing me how so suddenly they grow and change so much!! Yes, exactly! The little child disappears… what amazed me too was the quick change of the voice! Me too – that seemed to happen so suddenly! Joy, the waterfall looked lovely, all was not lost at least! We have many waterfalls in NE AL and a beautiful one in our city! Lovely photos of you and Son and Husband! I love waterfalls Pam, I’m sure your AL ones are really spectacular. This one was lovely, I’m glad we got to see it and we all loved the walk down. It looks so beautiful, and green! 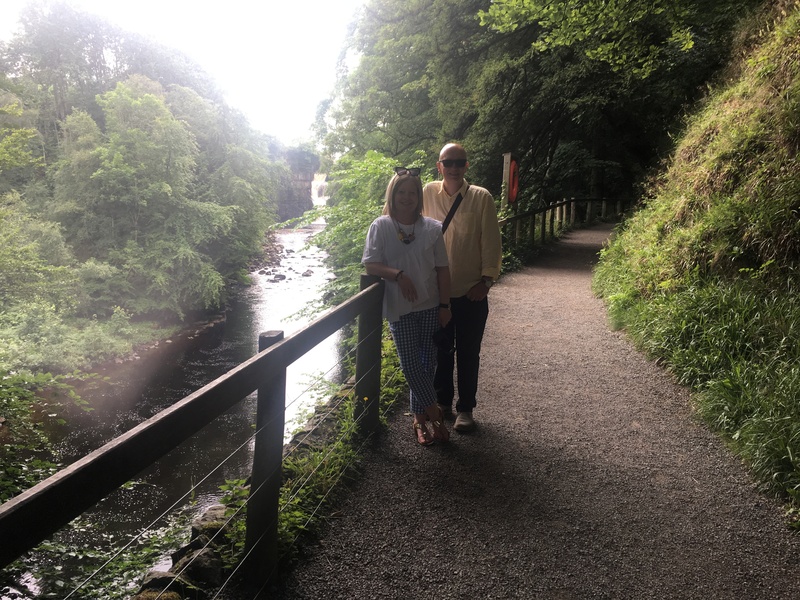 It is a gorgeous spot, we loved exploring here albeit in a more hasty fashion that I would have chosen!! 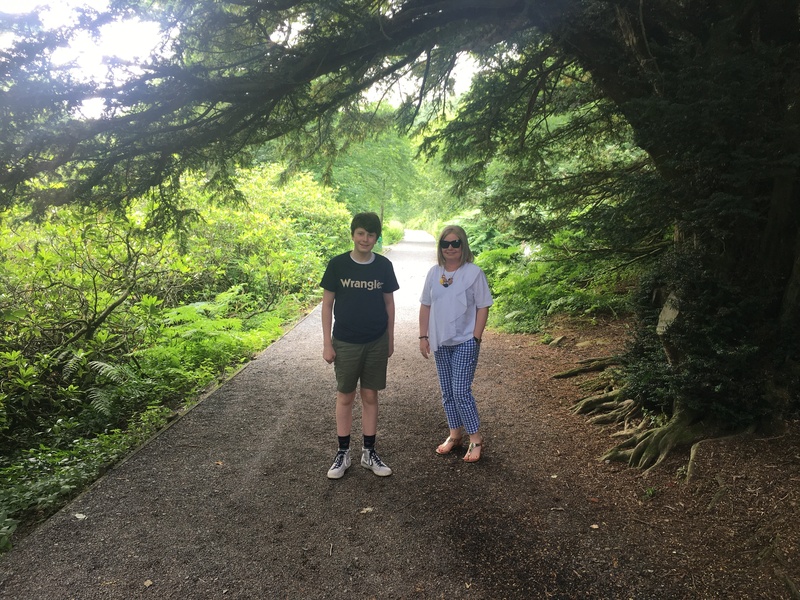 He is growing and growing, I can’t quite take it in – every week I think he is a bit taller. Keeping him fed is another challenge!! Oh don’t even mention the shoes, we can’t keep up!! I’m sure your little grandson is changing a lot too – times flies past far too quickly I think. It is a great place. What a shame you have no pictures of Husband’s earlier visit! Never thought about that – might get my mother-in-law to have a look, would be good to compare!! That’s assuming he had a camera on the school trip – he can’t remember. HaHa, I like to do the old picture/new picture comparisons! I know – it’s a great idea!! You should have gone to nearby Hardraw Force for the highest unbroken waterfall in England! Just had a look at the website – it looks very impressive. Wish we’d done that now! The pace looks so lovely and serene. It really is just like that. It looks like a lovely spot for a wander and I personally never tire of seeing waterfalls. Biting bugs, however, I could definitely do without. I get nasty cellulitis from insect bites and, annoyingly, insects seem to like biting me. It even landed me in hospital once. I, therefore, think it wise that you turned back before you got chomped to pieces. PS Your son suddenly got tall. Insects just love me too (unfortunately) and I don’t react well to the bites. I got away with 4 on this trip but it was still annoying. He has shot up over the last few months and seems to be growing like a weed over the summer!! I’m sure you’re going through this too Laura with your boys. Indeed. It’s ridiculous. A few months ago, I bought my oldest a pair of jeans that fitted perfectly; he’d outgrown them ONE WEEK later. Crazy. This sounds like a great way to break up a longer car journey – though what a shame that those pesky insects decided to intervene when they did! Insects love me no matter where I go, just wasn’t expecting to be munched here!! It was a pain but at least we got to see the waterfall! Me too – can’t resist them!! I’ve also been here many, many years ago, possibly on a school trip like your husband. It looks beautiful. And I see several people have already commented on the thing that struck me – Son’s growth spurt! He is quite the young man now. It is really stunning Anabel, probably not changed much over the years and I’m glad my husband remembered it from so long ago!! I am reeling myself at how much he has grown over the summer particularly. All of a sudden he is turning into a man and I’m not quite ready for it!!! It sure looks like a gorgeous place! Lush green and beautiful woods! Amazing pictures! 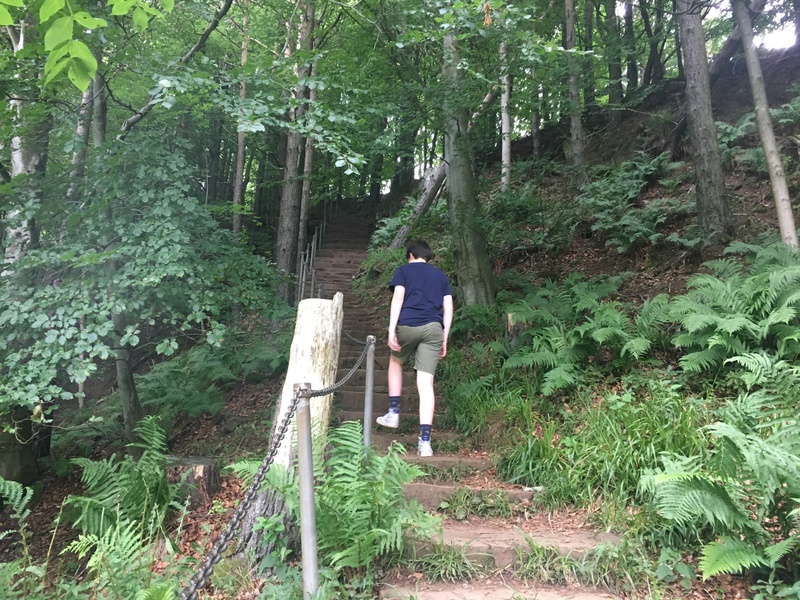 It was really lovely – a stunning walk! Wow, very pretty! Your son is growing to be a handsome young man! It was such a lovely spot! He is growing way too fast!! The forest was so lovely and peaceful and that waterfall at the end was the icing on the cake! It was such a gorgeous spot Rosemary, I should bring insect repellant everywhere though, I never learn!! 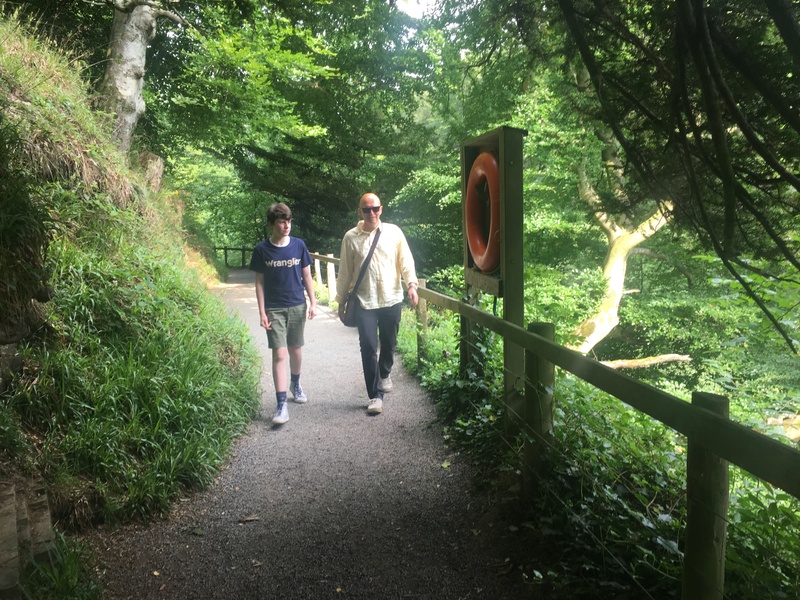 Just got back from a lovely time in Devon – one more week of holidays to go so we plan to make the most of it!! Hope your weekend is going well. Sounds lovely Joy – Devon is a beautiful part of the world! Yes I’m a magnet for mosquitoes too they even go after me when I’m wearing the repellent! We have taste of spring here – so nice to have the sunshine back. Hope you have a great rest of the holidays – can’t believe it’s almost September! It looks so peaceful. Beautiful! Sorry about the insect bites. Those pesky bugs!!! It was lovely though and we enjoyed it despite the bites! Thank you, it is such a gorgeous place. What a gorgeous forest! I would have turned back too… darn bugs! They love me (unfortunately)!! We did still love the walk bites and all!! Phew! I felt panicked for you but glad you got to experience it. Just stunning. And finding that stream after 80 steps was an added bonus! It was a gorgeous spot, next time I will bring insect repellant!! That looks like a very peaceful day, Joy. Were there many others on the trail with you? No George, we had it all to ourselves which was such a lovely surprise!